As you probably know, Painted Dogs (African wild dogs) are highly social. They rarely fight, even over food (unlike most other predators), and will regurgitate food for sick and injured adults in their pack. During my recent travels in southern Africa I saw 4 different packs, and that included a lot of pups. Every time they finished playing they would all flop down together, in a pile. There were heads on backs, feet on heads, tails in faces and ears everywhere – a perfect expression of their highly developed social nature, and a perfect painting composition! Tomorrow’s sketch is of browsing elephants. 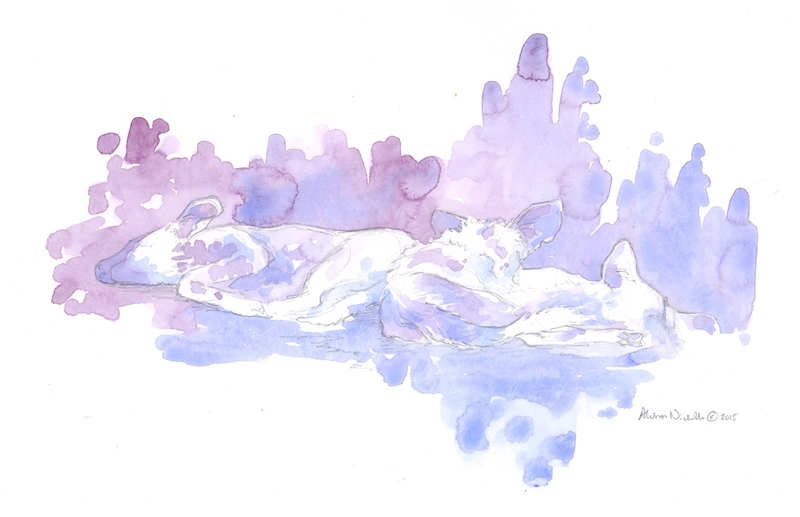 This entry was posted in African Wildlife, Blog Posts, Field Sketches, For Artists, Painted Dogs (African wild dogs), Watercolors and tagged African wildlife art, alison nicholls art, painted dog art, Painted Dog Research Trust, wild dog art on November 17, 2015 by Alison.